Games are all "try before you buy"
If you've never heard of Ouya, the $99/£99 Android-based gaming console, then you've likely never heard of Kickstarter. Back in 2012, the Ouya team took to the crowdfunding website, preached about open source gaming and promised a console to anyone who chipped in $99 or more. The team ended up with over $8 million in funding. Needless to say, heads turned, and gamers and developers began to take notice. Many months later, the Ouya's release date has arrived. Kickstarters who pledged enough have begun to receive their systems, and the console is being sold by big retailers like Amazon and Best Buy. Now the moment of truth is here. 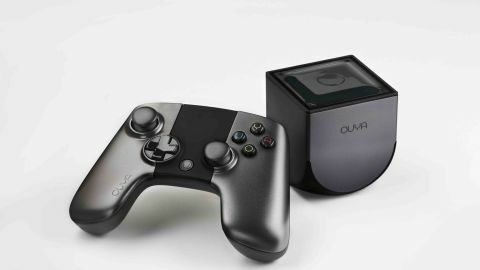 Has the Ouya's mouth written a check its processor and launch lineup can't cash? Has it cracked the dam of the closed console norm? Or has it merely presented a reasonably priced Android box that will satisfy tinkerers and casual gamers? You're about to find out. That's not a powerhouse set up, but the Ouya's library is mostly indie games and ports of mobile titles, not graphically intense blockbusters. Play is where you'll find games and apps you've downloaded. It has a habit of arranging things in order of most recently accessed. It's irritating, like the Ouya is constantly shuffling the deck on you. Discover is the Ouya store. It looks like the homepage of Netflix, only instead of arranging titles by genre, they're in playlists, of sorts. There's a list at the top titled Featured, which we're assuming are titles Ouya is pleased with and looking to promote. Then there are lists of games chosen by developers and media personalities. Discover is a cluttered, repetitive space where a lot of the same games are featured over and over again. For example, Towerfall is currently the number one game in the first five lists on Ouya's Discover screen. This makes it hard to get a sense of how many games are actually available for the system. You can actually browse by genre, but that option is buried at the very bottom of the screen. Browsing and downloading games is a quirky, occasionally frustrating experience. The Discover screen takes a while to populate, and often leaves a lot of blank tiles before previews pop in. Then once you've selected a game to download, there's no queue to see the progress of all your choices. Several times we selected a few games for download, left to do something else, and came back to find that only the last title we chose had downloaded. We're still not sure how Ouya's queuing works. The most unfortunate part of the Ouya experience is easily the controller. Like the system itself, it's not bad to look at, but after using it for a little while, the flaws become obvious. The controller feels hollow, probably due to the AA battery slots located under each grip. To get at them, you pop off the faceplates, which makes this peripheral seem extremely cheap. Unfortunately, it's not really that cheap. While you get one controller with your $99/£99 system bundle, a controller on its lonesome costs $50/£39.99. The Ouya's shoulder buttons offer a spongy, unpleasant press. Pull them slowly and you can actually hear the squeak of plastic rubbing against plastic. So the aesthetics aren't wonderful, but how does the controller work? Sadly, not very well. We experience intermittent but not infrequent controller lag. Playing at a desk only a few feet from the Ouya, the response time between the system and controller was perfect. Bringing the Ouya home and adding it to our entertainment center was what caused issues. We're not sure if it was interference from other electronics or something else, but we had often experienced severe input lag when playing from the couch. We were shocked to find that sitting up and leaning forward sometimes helped. It's unacceptable that our posture and the matter of a foot or so could affect connectivity so severely. Like the controller, Ouya's performance was inconsistent. The system leaps to life when powered on, menus are snappy, and games load in a reasonable timeframe. But then often times the Discover store wouldn't load properly, and a few of the Ouya's best games performed poorly. To name names, ChronoBlade's framerate starts to stutter as soon as you unleash attacks with three or more foes on the screen. That's a big problem, since this is a Diablo/Gauntlet Legends-style dungeon brawler, where you and a friend take on dozens of enemies at once. What's really sad is that this is a Facebook game, one meant to be played on a browser. This is either a sign of poor optimization, or that the Ouya's Tegra 3 chip isn't up to the task. Either way, not good. The Ouya also runs awfully hot. After an admittedly song session of three hours or so, we went to turn off the system and discovered it was quite hot. Not fire hazard hot, but disconcertingly warm to be certain. According to a ticker on the official Ouya website, there are 208 games available for this nascent system. That's a generous offering, especially considering that every game has a free component. Games are between three and fifteen dollars, and the Ouya has a generous "try before you buy" philosophy. That's fortunate, since a lot of the games are very atypical, and it's hard to know what to expect. There are some true diamonds amongst the rough though. Many of Ouya's games, including some of the best, like Knightmare Tower and Super Crate Box, take an arcade style approach. This means that rather than progress through a story where you can save your progress, you see how long you can survive, then start over and try to best that run. There are some great games in this vein, but they likely won't appeal to the average Halo fan. Then there are a lot of self-aware, ironic indie type games like Saturday Morning RPG and Fist of Awesome. There are games with purposely old school graphics and lots of references to eighties and nineties pop culture. You have to be enjoy the game's sense of humor to get the most out of the game. Most of Ouya's larger, more fleshed out and traditional games are holdovers and ports from years back, or other systems. There's Final Fantasy III, a classic title first released in 1990, and A Bard's Tale, a tongue in cheek RPG that's been kicking around since 2004. There are a few traditional action titles, such as Shadow Run. It's a decent third-person shooter in the vein of Gears of War, but it's been available from the Google Play Store for over a year now. With most of these games, the attraction is being able to play them on your TV. It's not that Ouya is the only way to do this, you could hook a PC up to your flatscreen with HDMI, or use All Share or the right adapter with your Galaxy S4. The Ouya is just a simpler method more likely to appeal to the less tech savvy crowd. Ironically though, it's the more technologicaly inclined that will probably have the most fun with the Ouya. It's advertised as moddable and hackable, so you could conceivable load pure Android onto it and just pop into Google Play, where there are a lot more games, abeit not as optimized for the big screen. There are also ROMs and emulation, which we would not endorse, but the possibility is there. If you're willing to treat the Ouya as a science project, not your primary entertainment epicenter, you'll probably like it a lot more. What the Ouya could really use though, is a video streaming service. Right now all it has is Twitch, a service that lets you watch other people play games. Games that the Ouya can't run. With Netflix and Amazon onboard, it would have been easier to recommend the Ouya as a media streamer with some decent games. Oh Ouya, how do you stack up? Your philosophy is so admirable, your price desirable, but what you actually deliver, well it isn't much. At $99/£99 for a controller and system, the Ouya is priced to move. It's also attractive and demure, tiny and unassuming next to your typical console. It does have a few very fun games. Tiny Tower, Knightmare Tower, Super Crate Box, You Don't Know Jack and Deep Dungeons of Doom were among our favorites. These game all offer some sort of free demo content, so it's hard to get burned by the store. The Ouya's HDMI connection makes setup simple and means it outputs at 1080p. That means it could provide worthwhile streaming video. Also, since you can add external storage via USB, you only need to be somewhat tech savvy to root it and install vanilla Android. Someone with the right set of hobbies could have a few fun weekends tinkering with the Ouya. The Ouya's interface is obtuse, and doesn't make it easy find games. We had titles recommended to us by a colleague, and couldn't find them through browsing until we just typed in the name. If we hadn't been told about the game, we may never have found it. The Ouya's controller frequently lagged and made games unplayable. That's a cardinal sin of video game hardware. A few of the games suffered from poor frame rates as well, and the Ouya ran quite hot after a few hours of play. The Discover tablet was frequently filled with blank tiles, and took a while to populate. All in all, the performance comes off as unstable. We know it's a game console first and foremost, but to earn a place in the living room, the Ouya desperately needs some media services. Finally, we have to say the Ouya has no killer game, no title that made us think, "yes, this is why one buys an Ouya." We really wanted to like the Ouya. Honest we did. The system's open philosophy and low price are admirable, especially after all the Xbox One DRM craziness that dominated E3 2013. But the Ouya hasn't delivered a stable product, enough compelling games or controller that works to an acceptable degree. That's not to say that the Ouya team can't right the ship. We'll be watching the Ouya to see how things improve, and will gladly update this review if new titles and stabilization make the Ouya less of sketchy investment. Ironically, we're still playing Knightmare Tower, but on our laptop, in a browser. The Ouya has turned us on to some great games, we'd just prefer not to play them on the Ouya.